The spectrum of board and card games extends on one end from requiring significant analytical and mathematical ability to the lighter end requiring basic knowledge of numbers and colors. The rub here is that games don’t have to be complex all-day affairs to be engaging. Often, it’s the simplest, combination-making games that deliver the right enjoyment for a particular group. The game setup is very straightforward. Seven cards are dealt to every player. These cards will include various colors of train cars numbered from 1 to 7 along with purple Cabooses numbered 8. Broken Cabooses with a letter B are also included. The train cards are cute and colorful in an Americana red, white, and blue sort of way. Once every player has a seven card hand, the deck is placed in the middle of the play area and a single card is revealed to the North, South, East, and West directions of the deck. This creates “Corners” in the Northwest, Southeast, etc… These revealed cards form the start of runs of cards to be made as game turns progress. 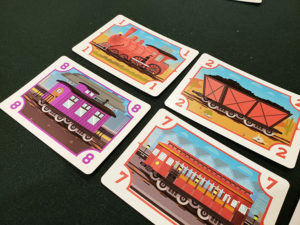 Play a card or series of cards – Using cards in hand, a player may play any number of cards to a train pile that match in color. The played cards must be a sequence of descending numbers. For example, if a pile has a red “4” on top, only a red “3” can be played next. Once a 1 is played to a pile, no other cards may be played to that pile. 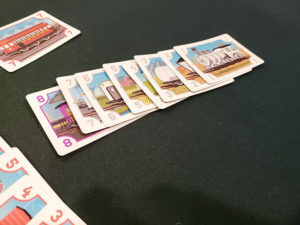 Move cards from other piles – Players may also pick up cards from an existing train pile and deposit them on another pile, again, matching the sequence of numbers and color. This is similar to how cards are moved in Rummy. 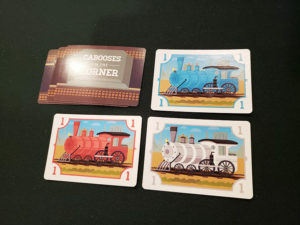 The only purple cards are the cabooses (caboosae?) which get put (sigh) in the corners between cards. Start a new train pile – By moving an entire train pile, the space left can become empty. A player can place a new card on that space, anything except a Caboose or Broken Caboose card. Play a Caboose in the Corner – Players who have a numbered “8” Caboose card in their hand can play it to an open corner space. Once this is done, players treat this as another train pile for making runs and moving cards. Play a Broken Caboose – If an available corner space is empty, a Broken Caboose played there will block the space for the rest of the game. This limits the number of active Cabooses which can be played to. Using all of these actions on their turn, ultimately players are trying to get rid of all cards in hand. The first player to do so wins the game. The play area layout creates eight spaces for placing cards. At first glance, Cabooses in the Corner seems like a kids game. It does have all the right elements and can certainly be fun for family game night. The cards are bright and friendly and games can play quickly with player counts at 3 or less. With 4 or more players, waiting for a turn can be a little trying at times if a player has a lot of moves to make. 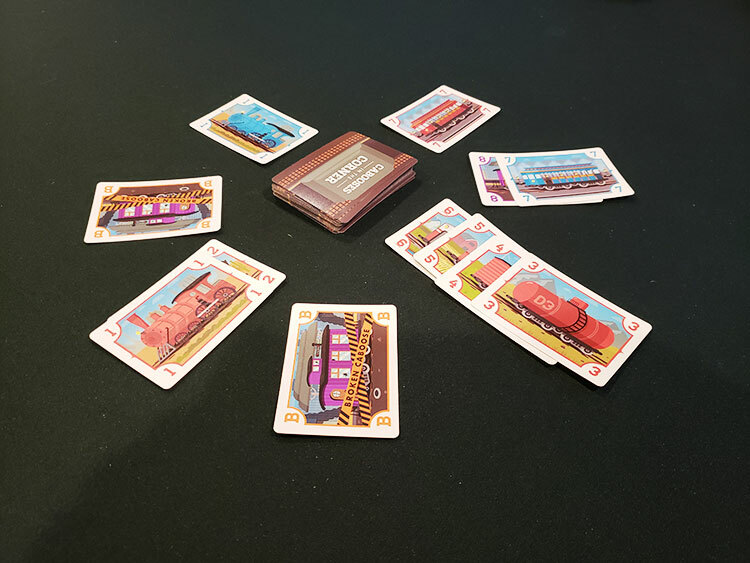 As players create runs of cards, they’re looking to move these cards onto the cabooses to quickly win the game. Ultimately, it’s the combination of Rummy with an Uno-style of objective that gives the game some staying power. Although it’s missing some additional cards that make Uno aggressive, it still has the capable feeling of a competitive game. The major highlight with this title is that it’s got a little bit of strategy that isn’t obvious right from the start. Playing a “1” card to an empty train pile space effectively shuts down the play of cards and can give someone the win if they time their turns correctly. It’s not deep, but it keeps players guessing, especially with only 3 colors in the game. 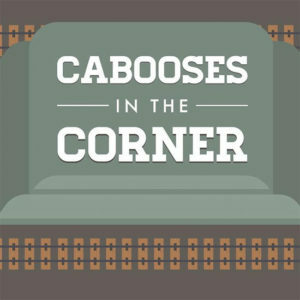 Cabooses in the Corner is light and a perfect game for a casual night with the family. It’s also a great game to let kids teach a game to grandparents who might already be familiar with some traditional card games. Players who enjoy a light theme applied to card game classics will especially enjoy this as well as gamers looking for a filler title that’s easy on the brain. This is an great game. 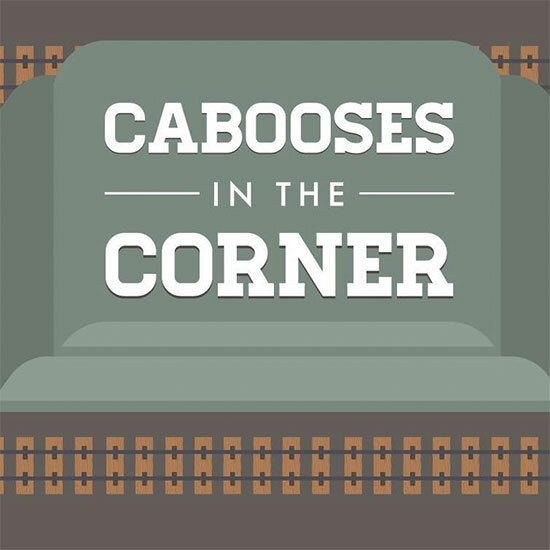 The review really brings up the fun and best parts of Cabooses. Always to cool to play it with family and friends.